Tete de Moine means 'monk's head'. This Swiss gourmet cheese was originally invented by the monks of Belleray Abbey in the Bernese Jura, and the brothers taught the local farmers how to make it. Unlike most other mountain gourmet cheeses which tend to be very large, it is made in small drums. The rind may be smooth and slightly greasy, or rough and brown in color. The paste is firm and creamy to straw-yellow in color, darkening as it ages. There may be small holes or horizontal fissures in the paste. 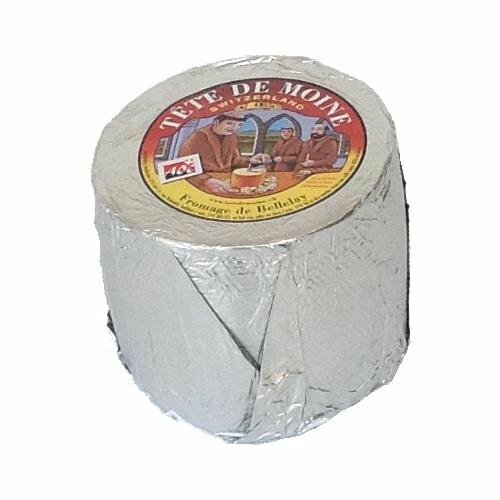 Older Tete de Moine cheeses smell strongly of roasted nuts with wine-like aromas. The flavor is sweet and tangy, with musty wood mold and nuts. Tetee de Moine can be sliced vertically but to get the frilly curls of cheese traditionally served in Switzerland you will need to use a girolle. The curls are achieved by turning the handle of this special knife on a stand and shaving the cheese across the top and a little way down the sides. This is naturally **VERY** STINKY & has spots of mold. Do NOT buy if you are not OK with strong cheeses. Tete de Moine as a "Schmear Bacteria" on the outside that is very soft, smelly, and "schmears" off when handled. The outside rind is NOT meant to be eaten. If you have any questions about this product by Emmi, contact us by completing and submitting the form below. If you are looking for a specif part number, please include it with your message. Deluxe Men's Gourmet Gift Basket- features Smoked Summer Sausages, 100% Wisconsin Cheeses, Crackers, Pretzels & Mustard | Great for Parties!